‘Sat Nam’ is a mantra that we use when we practice Kundalini Yoga. A mantra is a sound we use to project the mind on a particular frequency. If you take a string and stretch it and pluck it or strike it or rub it, the string releases a sound that fills the air with sound waves. A violin is a sophisticated model of this. A symphony gets even more sophisticated. Similarly, when you sit with a long, tall spine and vibrate the sounds Sat Nam from the root of your spine through the brain and into your auric field, you are a-tuning the symphony that is your own being to the infinite truth of all being. 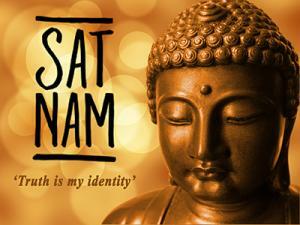 So, Sat Nam is less of a word or expression; it is an experience of the true essence of you aligning with all Truth. This truth is not a matter of true and false or right and wrong. This truth has more to do with grooving within the essence of all that is true. Sat Nam is often referred to as a “seed mantra,” a mantra that resonates with the wisdom that says within the seed is contained all the knowledge of the fully-grown tree. So, when you plant such a seed within your consciousness, over and over and over again, your soul awakens and you are given your destiny. I wish you abundant Summer season filled with much love, passion and adventure. As always, I am here to support you in this life journey – and welcome your feedback.